Golf Tourism Scotland, the industry body representing tourism businesses from accommodation, travel providers, tour operators and golf course sectors celebrated its annual awards dinner recently at Turnberry. In the aftermath the usual press and PR was generated by the organisation with Flash banners for each winner's website, Hi res images downloadable from a specially created media page and hi res logos of the awards for printed media. New for 2009 however was a series of live interviews of each of the winners. The interviewer was Yvonne Alexander of Word Association and all the winners give their opinions on the market and their own sector. These interviews were then loaded onto YouTube and GTS' own website. 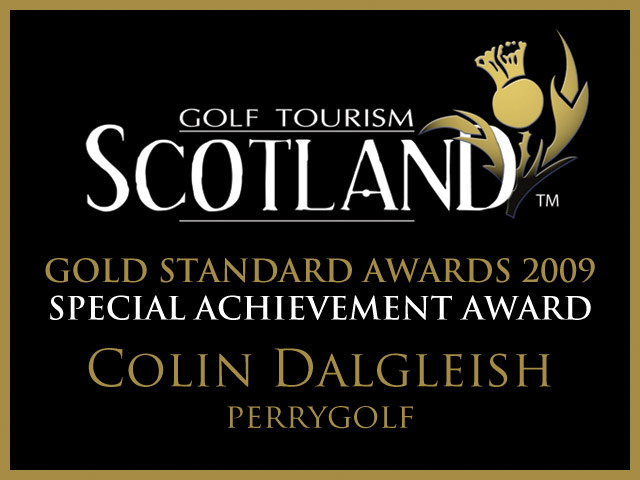 It's a nice touch and Ian McCaig of The Edge Studios explained the benefits, "The GTs awards dinner has become an annual celebration of the best of the golf tourism sector and the work done since the awards ceremony has raised the profile further. The interviews have helped personalise the whole process and offer a different dimension to the normal. 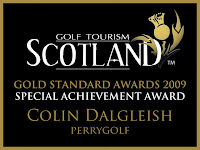 We took Yvonne's Interviews and easily uploaded them using our CMS, The Claymore Project, into www.golftourismscotland.com "
The new site was launched in time for the awards ceremony and is unique in that 85% of the copy is Business generated Content. Listen to the GTS Interviews online now and perhaps get an idea of how you could use some audio clips to promote your products or projects. We were approached by Laurence Young who owns the course to look at what we could do with the online presence and make some suggestions. The result we believe is pretty impressive but that in large part is down to the product and the work put in by the team at the golf course itself. The website is driven by our own content management system The Claymore Project and this allowed Laurence the ability to go online with his staff and update the content, images and metatags while we concentrated on pulling together the design that reflected this unique golf course. The nine hole course is without a shadow of a doubt one of the most beautifully located courses in the country - have a look at the image from above - and really should be played if you're in the area. The facilities are excellent and would put many larger clubs to shame. Golf's Hidden Gem category is overused (and we hate it!) so let's call Dragon's Tooth an Undiscovered Diamond! The site itself was designed by Steven and incorporates a sympathetic layout powered as we said by The Claymore Project. It also incorporates a new Dragon's Tooth Facebook Page and a redesign of the ConstantContact email features. Twitter will follow as will integration of Traveline Scotland information and the possibility of accommodation reservations using a fully integrated Bookassist model. The main thing about the website however is that old truism about images making the difference. The layout only emphasises the beauty of the location through the images. The words support, the metatags assist the searcher but the images sell the product almost on its own. When you have such tools to work with web design and online marketing gets a wee bit easier. Thanks for your trust Laurence and we look forward to a long term relationship. Listen to the GTS Interviews online now. Wot a load of rubbish. That was the first reply we got to the publication of our tourism survey yesterday. Not very detailed granted but clear and exlicit. Curiosity however got the better of me and I had to find out more and my request for more received the following. "I have used many Tourism sites. Adveritised on then. Listened to all the promises. Used Visit Scotland for 5 years. Spent as much as we earned trying to get good business. I have yet to find someone who is trying to help me. Good advertising is too expensive. I'm now trying Google. I still believe they are all a load of old rubbish. Maybe you can tell me different ? We were Visit Scotland Four Star and have a Marvellous Visitors book." The repsondant was from the North Highlands but the sentiment could be replicated in any area of Scotland. Our response? Well it's the way we see it; not necessarily comfortable reading but we believe honest. Hi , major can of worms you've opened up there! With online marketing there can be no promises only the aim of better (not even best) practice. The rules change but the goals remain the same - hospitality providers need to generate increasing numbers of direct clients. We as a business provide web design, online marketing support and our own online reservations system (Bookassist) aimed at the independent tourism operator. We don't always get it right first time but learning - even through quick questionnaires - is always a priority. VisitScotland, Google, Bookings.com - none of them are useless. All provide opportunities for the small business to utilise, test, amend and adapt. What is useless is a tourism industry in Scotland expecting the public sector to deliver on their behalf. That is a general not a specific statement but is all the same true. We are in recession, the public purse will be squeezed for years to come and we as an industry had better utilise our own resources and plan to take more responsibilities for our marketing actions. The public sector even if they should be doing it - and I would debate it - will not have the funding to do more; they will have to become smarter and focus on the bigger picture destination marketing of Scotland not the micro regional or local initiatives that the small business operator across Scotland is demanding. Increasingly you have to take responsibility for being found and doing what you can to ensure you are; you cannot rely on third parties doing this for you. Seeking direct sales must be a mission; being found therefore and having a professional web presence is therefore essential not optional. Try typing bed and breakfast Dingwall into Google and see how you come out. Complete that attached audit we do for our clients and decide for yourself whether you could do better. I have attached some information on the basics that small businesses need to consider. Sure good advertising (although I'd suggest "marketing" rather than advertising) is expensive but not nearly as expensive as bad advertising. Being spoon fed by local tourist boards has arguably not been an option for a decade. Yes there are joint advertising opportunities out there; there are even some excellent Destination Management Organisations (DMO's) about and while they are not the end solution they will provide operators such as yourself the opportunity to discuss and collaborate where economically viable. You have to think increasingly from the perspective of the visitor. Kipling's Six Honest Men - "Their names are What and Why and When And How and Where and Who" always spring to mind. Get to understand the motivation behind your customer and you'll be in a much better position to convert from the hidden cost of bad advertising (or none) to the clear benefits of good marketing. I'm not lecturing here, the choice as always be that of the individual but I can assure you that the days of relying on others for your business has gone for good. You have to make your own choices and those choices have to be based on knowledge - I would humbly commend you read the thoughts of others like you, as distributed in the survey results, and learn from them and indeed with them. 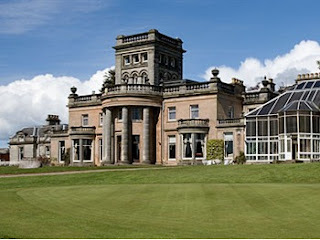 Letham Grange Hotel, Golf & Country Estate in Scotland being refurbished. Letham Grange Hotel, Golf & Country Estate, one of the best kept golfing secrets in Scotland, is undergoing a £300,000 refurbishment as part of a major upgrade of its facilities.Set in 300 acres of parkland, Letham Grange boasts two 18-hole courses and the extensive redevelopment program is being undertaken on and off the course to modernise the resort near Arbroath. 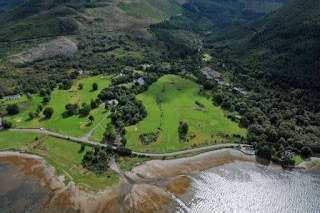 Refurbishment work includes upgrading bedrooms, opening a contemporary new brasserie and bar, the launch of a new website www.lethamgrangegolf.co.uk and improving the drainage on the resort's two courses - the Old and Glens. Jamie Le Friec, general manager at Letham Grange, said: "I am absolutely delighted to be involved in this project. My background is in developing resorts to their full potential and, with the quality of accommodation and golf that we have here, we are set for a bright future. "We are in the middle of phase one of our refurbishment work, and exciting building development plans are under consideration at the moment which will concentrate on hotel and alternative leisure pursuits to broaden the country house, golf and leisure experience on the estate." Letham Grange was originally an early Victorian mansion house but was converted into a golf resort at the start of the 1990s. All 19 bedrooms in the main house are being refurbished over the winter while the new Grange Brasserie and Bar offers a choice of a la carte, two or three-course menus with sweeping views of the estate.On the course, money is being spent on irrigation, tree surgery and improving the bunkering to make the two courses playable all-year round, while further expenditure is planned in the New Year to introduce a new fleet of grass-cutting equipment for the greenkeeping staff. And a significant new feature of Letham Grange is the new interactive website which gives visitors the chance to check room availability and book online, as well as discover what else the resort can cater for including weddings, meetings and conferences and parties and entertainment. The 6,632-yard Old Course at Letham Grange, designed by Donald Steel in 1987, has been referred to as 'the Augusta of the North', features water on 13 of the 18 holes and includes its very own 'Amen Corner' around the turn.The Glens Course at Letham Grange opened four years later and while, at 5,276 yards, the par-65 lay-out is not as tough or punishing as its older brother, it offers its own series of challenges including the testing final four holes.Mr Le Friec added: "The owners are certainly committed to the long term development of Letham Grange and, with the continued support of the membership, who have been very supportive of what is a period of significant change, I am convinced that we are laying the foundation stones to reflect what is deserved by this magnificent location. "For more information about Letham Grange and its latest golf and hotel offers, go to www.lethamgrangegolf.co.uk or phone 01241 890373.